Home | Mold Manufacturing Cooperation - KOEI TOOL (THAILAND) CO.,LTD. Back to Fact-Link's Top Page > Mold & Die Design / Manufacturing > KOEI TOOL (THAILAND) CO.,LTD. Vision：To become the leader in the Mold production business. 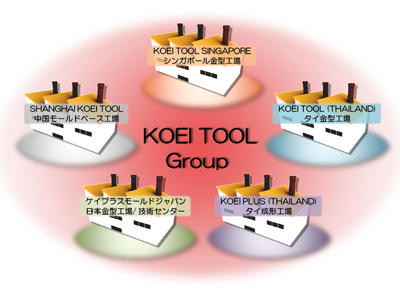 KOEI TOOL Group is developing business centering on Singapore in Southeast Asia.Change of deployment of a mold-making and plastic injection industry in recent years was seen, and the necessity for the further mold factory was felt, Japan (Osaka) was made to launch a new factory. Mold making structure for cooperation is built in Singapore, Thailand, and Japan, and it strives for business deployment in the Asia whole region and the further improvement in service from now on. Complicated processing is needed also for mold-base with complication of product form in recent years. And quick delivery correspondence has become common. 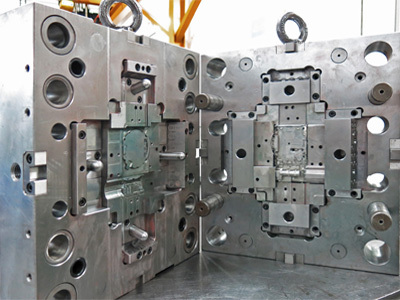 KOEI TOOL Group is making mold-base specially from early in such a situation at the China factory." Quick delivery, low cost, and high quality " are supplied to each KOEI TOOL Group factory at the motto.And it contributes to shortening readtime, quality improvement, and a cost reduction. KOEI TOOL Group has developed the business to die making and TRY Injection as a base of business since establishment.However, demand of mass-production injection plant establishment was obtained from various customer, and the necessity for a injection plant was felt from deployment of the mold-injection industry in recent years. Therefore, development of the manufacture industry founded the factory to remarkable Thailand.The structure for cooperation of the mold factory of group is strengthened, and the business deployment including mass-production injection is enacted to the improvement in customer service from now on. Metalworking technology in recent years is in an ever-progressing state. Therefore, absorption of new technology is an indispensable matter also in a mold-making industry.